Now in Australia. Shampoo Shield or Shampoo visor is the ultimate shampoo solution for kids or adults. Hands free bath visor that will not leak.No more fuss and fights when washing hair, no water or shampoo in your eyes. This product is durable! WASH, WEAR, SMILE. (Babyshower present, Paediatric ward, Nursing homes, special needs children anyone fussy about soap and water in their face.) Will shield shampoo and water from eyes. 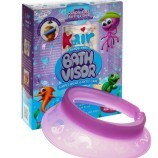 Kair Bath Visor, Shampoo Shield, Baby Shower Cap, Lowest Price.